Today I am finding out about Vanessa O from Tanuki Jewelry, who sells simple and unique handmade jewellery for everyday wear. I especially love Vanessa’s raw amethyst pendants, but maybe I’m biased because amethyst is my birthstone! 1. Tell us a bit about yourself and where the inspiration came from to start your Etsy shop. I’m from Vancouver, but also spent a year and a half in Dublin and London, and Tokyo for 7 years. I now live in New York, and am inspired by pretty things I see that may be simple or go unnoticed. I also have a love for photography, and hope that I can capture interesting things in unassuming places. I have always loved crafts and everything DIY, and I think the look of something being handmade is such a special thing. I had always wanted to learn how to make jewelry classes, and New York had so many options available to me. I started with wax carving and soldering, and the birth of Tanuki Jewelry arrived! 2. Do you have a favourite piece? Tell us about the thought process involved in creating it and why it is your favourite. While I would love to say all my pieces are my favorite pieces, I think my favorite piece is my stud row ring. It is simple enough to wear everyday, isn’t too dainty, and makes a statement without being overly designed. I hope that all my pieces come across this way. I don’t think jewelry needs to be loud to get noticed, and unique simplicity can go a long way. 3. What is it that makes your shop unique? I genuinely put in 110% effort into every piece I make. I like to think that every piece I make is something that I see worth wearing, and something, that if I wanted to, could be worn everyday whether traveling, at play, or at the office. I think my pieces are unique, simple and edgy pieces that are hard to find. 4. What’s next in the pipeline? Some people may want the look of sturdy looking pieces at a lower price point. I am currently in the works of making brass items. Stay on the lookout for my new items! 5. Tell us something about you or your shop that you haven’t previously shared! The name of my shop comes from the Japanese raccoon dog, a mischievous and jolly animal that is shapeshifting. I am offering free shipping to customers within the US and Canada up until February 14th, 2013. Convo me if you see any pieces (in the store or sold) that you would like to see in different sizes, or metals. 6. And finally, let us know where we can find you. Thanks for sharing Vanessa! Don’t forget to check out Vanessa’s shop – US and Canadian customers will have no postage to pay on orders placed before Valentine’s Day! The lovely people of Nashpop are featuring The Candy Tree on their blog this week where readers will also have the opportunity to win 2 (yes that’s right, 2!) of my Fabric Button Rings. Better yet, the winner can choose which 2 rings they would like to receive from my current collection! This is just a small selection of my rings – click on the picture to see the full range! Click here to read the feature and enter the giveaway! I’d just like to say a big thank you to Evey and Sara of Nashpop for their fabulous feature! Next up in my Etsy Love series is Višnja from TA-DA! Studio (what a fabulous name!) who sells handcrafted, illustrated jewellery. I just love the intricacy of Višnja’s illustrations, and what a wonderful way of showcasing her beautiful talent by turning it into wearable art! My name is Višnja Mihatov Barić, I’m a 28 year old artist living in Zagreb, Croatia, but I was born in the most beautiful city in the Adriatic coast, Zadar. I work as a graphic designer and illustrator and a couple of months ago I started making illustrated jewelry. I’ve graduated from the Academy of Fine Arts because I always wanted to become an artist, it was my dream come true. I was fortunate to be surrounded by my creative family, the are my biggest support and it means so much to me, especially for my work. I spend a lot of time on sketching, drawing, making things, and Etsy is a great place where I can show my art! It’s hard to say which of my items is my favourite, I really love them all because I put a lot of effort and work into each one of them. Every single part of creating one item is my favourite, first I make sketches, then I play with various shapes of polymer clay and in my head I have a vision of what drawing would go perfect with each shape. 3. What is the biggest milestone you have achieved so far whilst selling on Etsy? The biggest milestone? Don’t know, I think I’m on the right path with my Etsy shop! Hope I will continue with making my jewelry this way, soon there will be lots of different items in my shop, like bracelets and necklaces..My biggest goal is not selling, just making jewelry with my own hands, hopefully more and more people will like what I do! 4. What are your future plans for your shop and crafting in general? I’m taking one step at the time, I’m not rushing into something that I feel won’t work in the future. I’m still learning everything about Etsy and finding the best way to promote my work, it takes time and lot of patience. The only thing I wish the most, is to become my own boss and work full time creating jewelry! 5. And finally let us know where we can find you. Thanks for sharing your beautiful, unique jewellery with us Višnja! It’s always refreshing to discover something a bit different and I love the fact that each of your pieces has its own story. I hope you accomplish your dream of being able to create jewellery full time – I know I sometimes wish I could craft all day too! The Giveaway is now closed – thanks to all who entered! Winners will be announced shortly! My blog is pretty new and in order to give it a proper launch I have decided to do a giveaway! 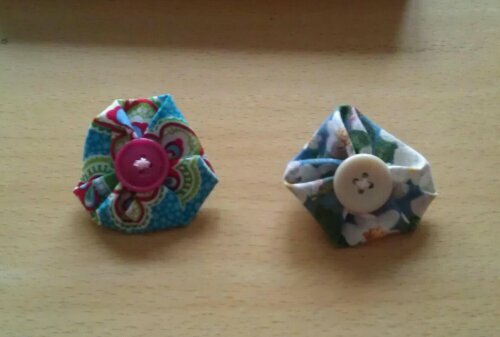 Up for grabs is two of my Fabric Button Rings made especially for the occasion ! These rings are made from colourful cotton fabric folded and stitched onto a knitted ring and finished with a coordinating button. The ring is knitted using stretchy cotton sock yarn and therefore one size fits all. This giveaway is open to everyone and I will happily post internationally. You can enter in a number of ways, just leave a new comment for each entry requirement you fulfill. I just had to share my latest creation as I’m very proud of how cute they are! Each fabric ring is hand folded and stitched to a knitted band and finished with a complimentary button. So simple, so cute, and they won’t break the bank so you can afford to get one to suit every outfit! I’ve just finished listing them in my Etsy shop so go have a peak for the full details.